Can You Spot These Common Advertising Mistakes? I frequently get questions related to advertising. So, I began to look more keenly at the advertisements around me. I wanted to find examples of things to do and not to do. I found this advertisement in my local paper. This provides a good specimen for my first two dos and don'ts. 1. Don't use absolutes. 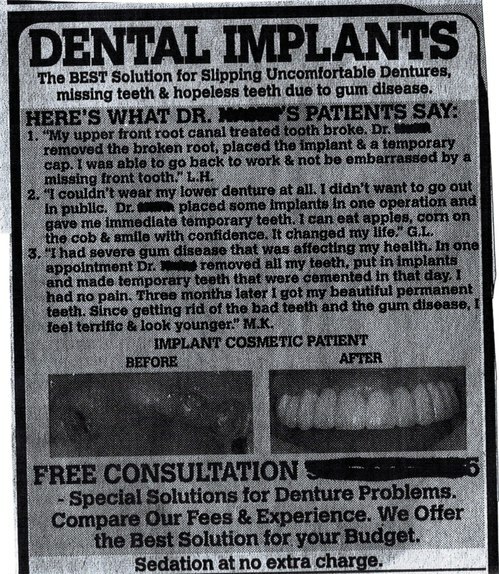 This ad touts that dental implants are: "The BEST Solution for Slipping Uncomfortable Dentures..." I am an attorney not a dentist, but really the BEST (the word 'best' is in all caps in the advertisement). Aren't there other solutions out there? Is a dental implant really the best solution? The advertisement goes on to say: "We offer the Best Solution for your Budget (this time the word 'best' is not in all caps; however, you see some random capitalizations that even an attorney would not ascribe). Again is it really the Best for my budget? Doesn't Dr. Jones down the way offer comparable pricing and installment payments? Don't use absolutes in your advertisements! There is always an expectation. There is always someone else that offers something akin and argumentably equal or better to what you are offering. 2. Do get permission before your print. I don't know about you, but if I were G.L., I would want the good doctor to ask before he printed: "I couldn't wear my lower denture at all. I didn't want to go out in public. Dr..... placed some implants in one operation and gave me immediate temporary teeth. I can eat apples corn on the cob & smile with confidence. It changed my life." Do get permission before you print testimonials! The speaker would be most thankful and the law requires it. I found this advertisement in the August 2012 issue of Popular Science. This provides a good specimen for two more dos and don'ts. 3. Don't print unless you can point to it. It you are going to make a claim, make sure that there is evidence that you can point at to backup your claim. And, if it is an advertisement for prospective franchisees, make sure you point to something in the FDD or franchise disclosure document. American Honda Motor Company in its ad for the Accord says that "J.D. Power and Associates has named the Honda Accord 'Highest Ranked Midsize car in Initial Quality.'" At the bottom of the ad in fine print (fine print-we will get to that) it cites an Initial Quality Study conducted by J.D. Power. Don't print it unless you can point to the facts! If you are going to make a claim, make sure you can point to the facts to backup your claim. 4. Declare your rights. On the very bottom of the advertisement notice you will find the ©2011 American Honda Motor Co., Inc. This stakes American Honda Motor Company's copyright to this advertisement. 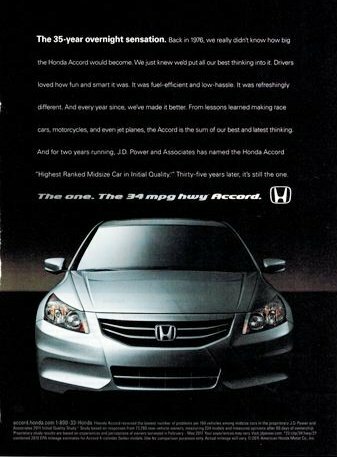 It says that the advertisement is American Honda Motor Company's original work of art and no one is allowed to copy it. And, yes that is the proper copyright format. The © symbol, the date, your company name. In this electronic copy and paste world, it is more important than ever to include a copyright notation at the bottom of your advertisement. Oh and while you are at it, include the other symbols: registered trademark®, service mark℠ and trademark™. Declare your rights! In this electronic copy and paste world, it is more important than ever to include registered trademark®, service mark℠, copyright© and trademark™ symbols in your advertisement. I found this tag on a shirt that I recently purchased for myself. It is a good specimen for my last dos and don'ts. 5. Do skip the fine print. It is all about transparency. Transparency is in. Transparency in pricing, transparency in government is all good. If you include a lot of small fine print at the bottom of your advertisements it looks like an advertisement for Viagra or that that your product comes with a lot of hidden terms and conditions. 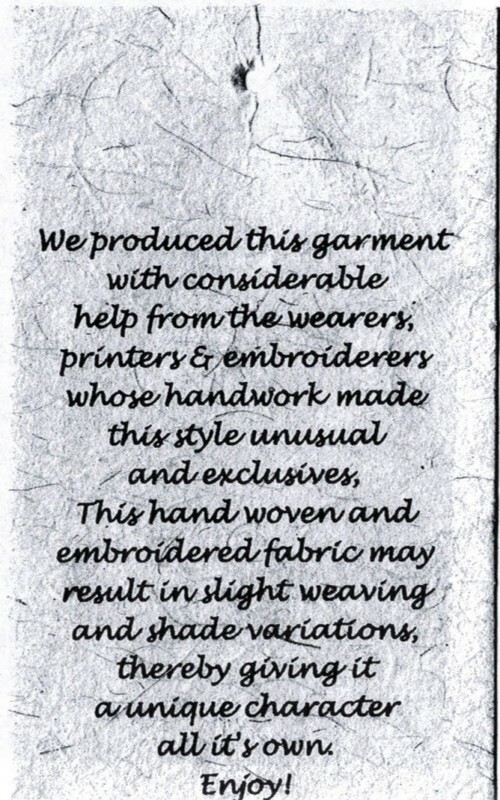 Instead of in fine print saying that my newly purchased shirt, after one washing would be faded and discolored, the tag nicely explained to me: "We produced this garment with considerable help from the wearers, printers, & embroiderers whose handwork made this style unusual and exclusive . This hand woven and embroidered fabric may result in slight weaving and shade variations, thereby giving it a unique character all its own. Enjoy! Do skip the fine print! There is a way to say everything. Say it without the traditional fine print legalese. Make everything you say a selling point. Legal Disclaimer: All advertisements are used under the fair use exception of copyright laws. I have not been a recipient of dental implants, me nor anyone in my household owns a Honda, and no animals, to my knowledge, were harmed in the making of my shirt.